Tokyo, Japan’s capital city and one of the largest in the world, has been thrown into absolute chaos. Smoke and fire rose high into the night sky and people ran for their very lives as a monstrous juggernaut from eons long past tore a path of destruction through the city. The primordial dragon Bagan, awakened from his ancient, glacial tomb by a twist of nature, now let loose his devastating might upon the world of man. The titan let loose an earthshaking roar as he swung his thick tail through a skyscraper and sent it crumbling to rubble, the tyrant taking pleasure in the senseless death and destruction inflicted on mankind at his claws. Bagan turned to see tanks and helicopters assembled against him, opening fire on him with everything they could muster. When the smoke cleared, Bagan was unfazed, the assault only enraging him further. White hot plasma surged up into his mouth and was unleashed in a cascade of pure destruction, vaporizing a large portion of the attack force in seconds. Seeing some still standing, Bagan raised his arms, summoning diamonds of energy in the sky above before sending them falling down on the remaining attackers, destroying them in a massive explosion. Roaring in victory, the ancient devil marched over to look through the ruins of mankind’s weaponry, making sure no human still drew breath within the twisted piles of slag. However, as he walked, he suddenly fell sideways with a roar of surprise. The ground underneath his foot had caved in, sending Bagan crashing to the ground. Snarling in fury, Bagan rose to his feet, only to be greeted by Baragon leaping out of the ground and sinking his teeth into Bagan’s shoulder. While the super monster’s thick hide withstood the attack, Bagan was startled this monster nearly half his size would dare assault him. Regaining his composure, Bagan snarled and grabbed Baragon by the throat and threw him a good distance away. The agile little kaiju managed to land on his feet and bellowed in rage at the primordial dragon, unfazed despite being completely dwarfed by Bagan in both height and weight. Bagan snarled fiercely, enraged this pathetic creature dare challenge him. Bagan swore that his smaller adversary would be nothing but a pile of ashes before the day was over. The ancient dragon let loose a stream of plasma at Baragon, but the smaller monster leapt to the side to avoid the destructive stream. Baragon leapt forward, attempting to bury his nasal horn in Bagan’s throat, but was unable to so much as reach him before he was kicked in the jaw and launched backward to the ground with a cry of pain. Enraged, Bagan swung his tail around, and brought it down on Baragon’s chest to crush the air from the smaller beast’s lungs. Baragon wheezed as he tried to rise again, only for Bagan to bring his massive foot down on Baragon’s chest and grind it in, trying to make the smaller beast suffer for its ignorance. Roaring in pain, Baragon knew he had to do something and let loose a powerful stream of fire into Bagan’s face, earning a roar of surprise and rage as Bagan staggered back. Baragon was quickly back to his feet and dashed off into the burning buildings to regroup as Bagan tended to his scorched face. More startled than hurt, Bagan recovered to find that the smaller Baragon had vanished. Not wanting to lose his prey, Bagan stalked among the buildings, reptilian eyes searching for any sign of Baragon. Seeing a building rattle, Bagan let loose his plasma beam into its side. Before the building was struck, Baragon leapt atop it and then catapulted himself through the air seconds before it went up in a huge fireball. The prehistoric kaiju landed on Bagan’s chest full force and bit down on the ancient dragon’s shoulder, shaking it fiercely. Snarling in fury, Bagan threw his head down and hooked his horn under Baragon’s shoulder. With a massive show of strength, Bagan sent his smaller foe flying through the air and slamming down hard on a building, smashing it to bits. Dazed, Baragon was left seemingly helpless as Bagan let loose a plasma beam, only for something to hit him in the side of the head and throw off his aim. This caused the white-hot energy ray to miss the downed Baragon completely and burn a hole through the center of the Tokyo Tower a good distance away, sending half the structure falling to earth. Enraged, Baragon turned to see who had dared to assault him. Varan let out a roar as he glided to a landing nearby, standing up to his full height and challenging the ancient devil beast’s reign of terror. Before Bagan could answer, a trumpeting roar sounded and Bagan looked to the side to find Anguirus in a battle posture as well. The distraction gave the stubborn Baragon a chance to recover and rejoin the battle as well. No one would know why these three in particular rose to challenge the primordial dragon, perhaps they were simply in the area or perhaps one of the old Yamato legends foretelling three guardians would defend Japan was ringing true. Regardless, Bagan’s destructive rampage had met a roadblock. Roaring in fury, Bagan refused to back down and let loose a plasma beam at Anguirus, only for the stubborn beast to charge under it and sink his teeth into Bagan’s hip, tearing into his flesh and actually managing to draw the demon’s foul blood. Enraged, Bagan slammed punishing fists into Anguirus’ skull and back, but the determined creature hung on for dear life. Before Anguirus could be completely dislodged, Varan leapt into the air, spreading the membrane linking his limbs and glided forward. The Kitami River god landed on Bagan’s back and slashed his head and neck fiercely, earning roars of fury from the tyrant. As Bagan tried to dislodge Anguirus and Varan, Baragon charged forward and drove his horn into the back of Bagan’s knee, finally earning a trickle of blood. As Bagan swung his fist back to try and strike the smaller monster, he found it clinched in Baragon’s powerful jaws. Enraged, Bagan swung around violently in an attempt to dislodge his enemies, bashing Baragon’s head into the ground and punching Anguirus in the side of the head repeatedly but to no avail. The tenacious kaiju simply refused to let go. Now enraged beyond all else, Bagan summoned his diamond storm and cast them down on his enemies, blasting them all off and sending them crashing hard to the ground. More infuriated than hurt, Bagan let loose his plasma beam, catching Anguirus in the back. While the kaiju’s carapace held strong, he still roared out in pain as flesh and spikes melted from the heat and the force of the beam knocked him hard to the ground. Varan managed to get back to his feet and leapt through the air at Bagan, only to be caught by the throat and slammed face first into the ground. Bagan picked Varan’s head up and slammed it back down to the ground before kicking him in the stomach and rolling him over. Pinning Varan beneath his foot, Bagan charged up a plasma beam and prepared to obliterate the proud kaiju, only for Baragon to leap on Bagan’s back and sink his fangs into the back of the dragon’s neck, throwing off his aim and saving Varan’s life. As Bagan staggered back trying to throw Baragon off of him, Varan looked at the burning crater right next to his head, thankful to be alive. Rising to his feet in time to see Baragon be grabbed by the horn and flung over Bagan’s shoulders, Varan leapt forward and glided toward Bagan, spinning forward in flight to use his back spines to cut into Bagan’s shoulder, drawing blood. With malice in his eyes, Bagan slammed his tail hard into Varan’s side and toppled him through a still burning building. Approaching, Bagan watched his shoulder regenerate from Varan’s attack and reached down, grabbing the creature by the face and lifting him clear off the ground before throwing him with all his might, sending Varan through the capital building. Before Bagan could inflict more damage on Varan, Anguirus recovered from the plasma beam and charged forward, spinning around and slamming carapace first into Bagan’s back. Bagan cringed as he staggered forward, blood seeping from a rather large number of holes that now poked in his back, though those quickly healed. Anguirus snarled as Bagan turned before lunging forward and attempting to bite down on the thick neck of the ancient dragon. Bagan saw this coming, however, and grabbed Anguirus by the nasal horn and held him in place. Bagan proceeded to send fist after fist into Anguirus’ face, eventually busting him open and drawing blood. Relishing his enemies suffering, it appeared Bagan didn’t notice Baragon sneaking up behind him. Baragon let loose a stream of flames from his mouth, only for Bagan to notice him and pull Anguirus around, using the noble kaiju as a living shield to block the flames. Bagan picked Anguirus up and threw him into Baragon, knocking both hard to the ground. Baragon quickly got out from under Anguirus’ body and let out a roar of fury, leaping through the air in an attempt to bite down on Bagan’s jugular. The ancient titan countered by lowering his head and catching Baragon’s stomach on it, goring the smaller kaiju. With Baragon roaring in agony as he hung from his horn, Bagan bucked his head and sent Baragon flying through the air and through a row of buildings. Baragon laid motionless in the rubble, blood trickling from his mouth. Confident Baragon was out of the fight, Bagan turned his attention to Anguirus, just in time for the stubborn monster to slam carapace first into the dragon’s chest, forcing him backward. Before Bagan could recover, Anguirus made another charge and repeated the move, slamming full force into Bagan’s thick hide and penetrating it. Bagan snarled and tried to counter attack, only for Varan to glide in and land on his back, biting into the back of his neck, allowing Anguirus to get up another burst of speed and slam full on into Bagan’s chest with his carapace. The combination of Varan’s weight and Anguirus’ momentum finally toppled the titanic Bagan, knocking him to the ground. Varan climbed on top of Bagan, slashing into his flesh as fiercely as he could. Anguirus took advantage by finally sinking his teeth into Bagan’s throat and trying as hard as he possibly could to tear it out, drawing blood. Bagan snarled and swung his arm up, batting Varan off him and allowing him to rise to his feet, but the tenacious Anguirus still hung from his thick neck, refusing to release his hold no matter what the giant did. Annoyed, Bagan slashed into Anguirus, trying to tear him apart but to no avail, as the stubborn kaiju simply refused to let go. Bagan began charging up his plasma beam. However, it finally erupted out of Bagan’s torn throat, blasting Anguirus off of him. Roaring in pain, Bagan held still and let his neck heal quickly. Varan, seeing this, tried to take advantage and glide onto Bagan’s back. Before he could, however, Bagan’s neck regenerated completely, allowing him to turn around and let loose a powerful plasma beam, striking Varan point blank in the chest. Roaring in agony, Varan was blasted backward into the air. Before Varan could hit the ground, Bagan let loose another plasma beam, putting all his strength into it and hitting Varan in the chest. Varan let out a final roar as he was engulfed in a huge fireball, his flesh raining down on the city. Bagan roared in victory, having finally killed the annoying insect. With Varan dead and Baragon out of commission, Bagan turned his attention toward Anguirus as the monster stood up, jaws still burning from the plasma beam that had torn its way out of Bagan’s throat. Regardless of the pain, Anguirus bellowed in rage, swearing to avenge the death of Varan at the demon’s hands. Bagan seemed to laugh, daring Anguirus to try it. Charging forward, Anguirus was met with a powerful swipe of Bagan’s tail, toppling him through a building. Recovering quickly, Anguirus leapt forward and bit down on Bagan’s arm, shaking wildly and tearing into his flesh. 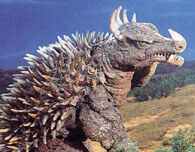 Anguirus managed to catch Bagan’s other fist with his carapace, allowing him to continue mauling his arm. The two monsters pushed against each other, their movements shaking the still blazing city. Finally, Bagan managed to get the leverage needed to force the stubborn dinosaur back and grab his horn. Pulling Anguirus off at the loss of a great deal of flesh from his arm, Bagan slammed Anguirus face first into the ground, breaking his nose. As blood poured from Anguirus’ nose, Bagan pulled him back up and threw him back first into the side of building, collapsing it on top of him. Now infuriated beyond all measure, Bagan let loose a plasma beam into Anguirus’ chest, driving the brave monster backward across the ground and through another building. Moaning in pain, Anguirus was too stunned to move, letting Bagan bask in the pain he’d inflicted. After that was down, Bagan prepared his diamond storm, slamming them down on Anguirus and earning roars of agony from his victim. As he was attacked, Anguirus realized something, Bagan wasn’t using his full power, and the quadruped knew why. Bagan was enjoying this. He wanted to make Anguirus have a slow, painful death so he was holding back. Bagan smirked. He raised his arms and summoned another diamond storm, preparing to finish the job, only to let out a roar of pain. Baragon, despite being severely wounded, managed to recover enough to sneak over and bite into the back of Bagan’s knee and tore into it, causing Bagan to cancel his attack from the sudden surge of pain. Tearing and biting into it, Baragon finally tore out the tendons from Bagan’s right knee, causing him to fall to one knee. Enraged at the sight of his bloody muscle and flesh hanging from Baragon’s jaws, Bagan grabbed Baragon’s horn and pulled him in front of him before ripping it out of Baragon’s head. Roaring in pain, Baragon was helpless as Bagan grabbed both sides of his head and squeezed, applying all his strength. Baragon desperately tried to free himself, letting loose all his fire into Bagan’s face, burning away layers of skin and tissue, but Bagan was too enraged to care. Finally, a sickening crack resounded and Baragon’s body went limp, his skull shattered. Bagan threw Baragon’s lifeless body aside and vaporized it with a full power plasma beam, raining more flesh and blood down on the surrounding area. Bagan snarled and turned back to Anguirus, however, he found he still couldn’t rise to his feet with his right leg, the tendons not completely regenerated. Before he could react, Anguirus charged forward and slammed full speed into Bagan’s other leg as it struggled to lift his weight, shattering the dragon’s knee and sending him falling to the ground. Roaring in agony, Bagan lifted himself up with his arms, managing to get onto his knees but at the moment was crippled near completely. Anguirus charged forward and sunk his teeth into Bagan’s throat, shaking it like a vicious dog, having the leverage to do so since Bagan had been brought down to more his size. Roaring in pain, Bagan prepared another plasma ray, but this time Anguirus released his grip at the last second, allowing the beam to burst out of the dragon’s neck and into the distance. Refusing to give Bagan time to regenerate, the tenacious quadruped resumed his bite, tearing deeper and deeper into Bagan’s throat. Realizing another beam would be pointless, Bagan grabbed Anguirus by the throat and tried to choke him out, but the stubborn dinosaur refused to let go, tearing like a rabid dog. Finally, Anguirus’ tore out Bagan’s throat, sending blood spurting from his severed jugular. Gasping and choking on his own blood, Bagan felt something he was quite familiar with but had never once felt himself, the fear he was going to die. Before the devil beast could have any hope his regeneration would save him, Anguirus lunged back into Bagan’s neck, biting down and shaking violently. With a great deal of his neck muscle already torn out with his throat, Bagan was helpless as with several shakes, Anguirus snapped the ancient demon’s neck. Not even letting go once Bagan fell limp, Anguirus continued to bite until Bagan’s body stopped shaking and he was positive the primordial dragon had breathed his last. Covered in Bagan’s blood, Anguirus released the defeated tyrant and let the body fall motionlessly to the ground. Looking around, Anguirus was saddened by the deaths of his allies, but had toppled the evil Bagan once and for all. Anguirus planted his feet on Bagan’s back and roared victoriously to the heavens. Once that was finished, Anguirus slowly marched away, heading back to the sea so he could return home to Monster Island, certain to receive a triumphant welcome.